Giving cars first priority in the Copenhagen traffic is a thing of the past. From now on cycling will be taken more seriously, whatever the cost. The words of Copenhagen's Lord Mayor Ritt Bjerregaard from the Social Democrats. Political rhetoric seems to be turning into concrete action. Since her election to the post in 2005 the Lord Mayor has cast all manner of ideas into the fray. Allied with Klaus Bondam - mayor for traffic and environment - she is trying to focus on their goal of creating the world's leading environmentally-friendly city by 2015. The focus is currently on increasing bike traffic and improving the infrastructure in a city where 36% of the citizens ride their bikes to work or school each day. That number should be higher. 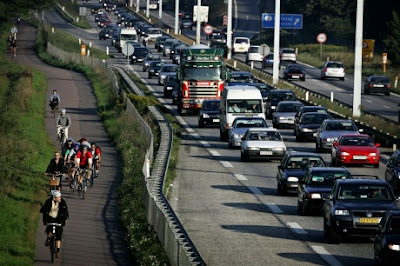 Cycling will be taken more seriously, even if it stings a bit for motorists or slams truck traffic. "If we don't make priorities we'll end up with something that we can't handle. If we don't act it will only become much more difficult", explains the Lord Mayor. "You either want cars in the city or you don't. That consequence surprises people. We are in the process of underlining our politics for the majority. It is making an effect", she says. 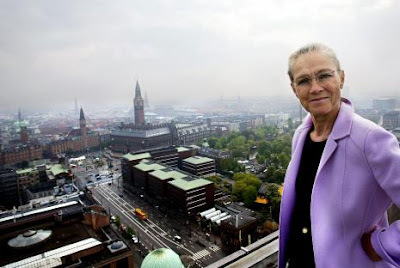 Bjerregaard has the backing of a majority of Copenhageners for many of her cycling initiatives, including the closing of a main street, Nørrebrogade, to cars. As the head of the Copenhagen chapter of the Danish Cyclist's Union, Erik Hjulmand, says, "Opponents use words like 'populism', but since when has it been wrong to listen to the citizens? When you take privileges from people, they will always protest". "Urban planning in the city has favoured the car for many years", he says. It looks like that is changing and changing quickly. According to Bjerregaard there are other inititives on the way to increase safety for the city's many cyclists. Many trucks drive through the city instead of taking the ring route. This traffic must be limited. The Lord Mayor is sticking to her demand for introducing congestion charges for cars in the city, even though the Danish Parliament is opposed. "They'll soon have to give in", she says. Positive experiences in Stockholm, Oslo and London show that congestion charges have an effect. Both Bjerregaard and Hjulmand are not afraid that Copenhagen will be surpassed as the world's cycling capital by a long line of cities in Europe and North America who have opened their eyes to the benefits of cycle traffic. The city has a massive headstart. It's all about working towards improving our established bike culture.